The Battlefield series is known for its Easter eggs, and already players are hard at work digging out Hardline's secrets. It's not out yet, but subscribers to the console-based "EA Access" program gained access to a 10-hour trial. 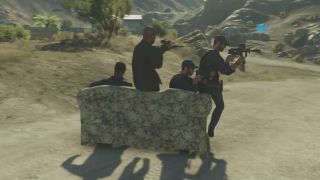 In that time, it was discovered that a sofa in Hotwire mode's Dust Bowl map can be driven around—as demonstrated in the video above by YouTube's 'JackFrags'. Hardline is out on PC next week.